HR Tool Design — ivy-yeh design. 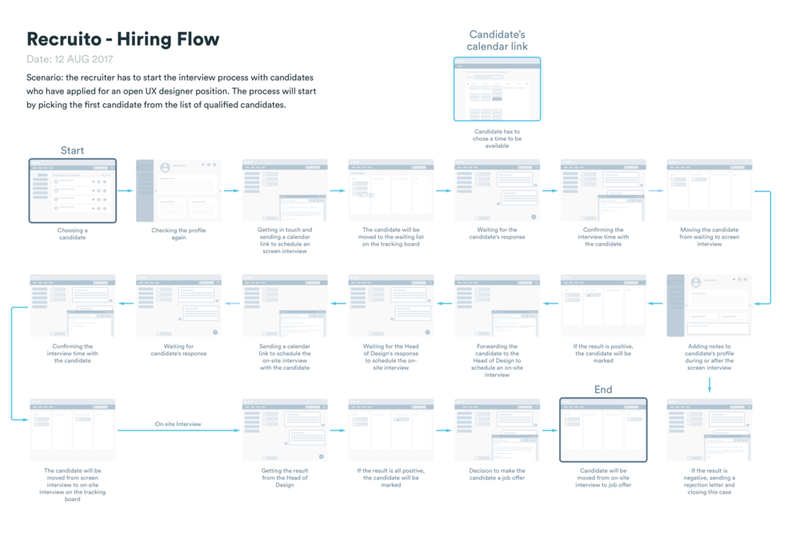 Recruito is an online tool that allows recruiters to find the best candidates for their company, by streamlining the hiring process from posting a job to managing candidates until the position is filled. Before I started to design, I did some research the most popular recruiting platforms and viewed their language pages and analyzed what they have in common to assume that it has a good effect on the visitors. Then I started to wireframe it and designed the mockup. Q: What are your tasks when you receive applications and which tools do you use? After receiving the application, I am doing the screening. I will forward the application to the responsible hiring manager then. I usually send an email but if I do not get a response, I will print the documents and search the face to face conversation. I usually use Google Sheets to write down notes, comments and feedback about the candidate. Our hiring manager usually uses Googles Docs to share documents. At my company, we also have an own developed software called ECL. The search function doesn't work well but the calendar is easy to look up a monthly schedule. Some hiring managers want to meet the candidates directly and do not want hiring manager to get involved. I will only do interviews when the hiring manager requests.